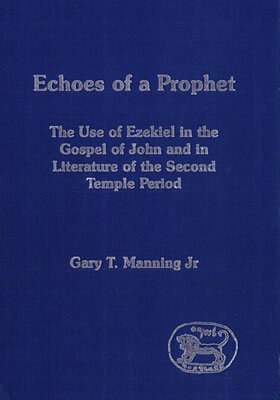 Echoes of a Prophet: The Use of Ezekiel in the Gospel of John and in Literature of the Second Temple Period (JSNTS 270; London: T&T Clark, 2004). "Hearers of John, Followers of Jesus: The Disciples of John the Baptist in the Fourth Gospel." Character Studies in the Fourth Gospel: Narrative Approaches to Seventy Figures in John. Ed. Stephen Hunt, Francois Tolmie, Ruben Zimmermann. Tubingen: Mohr Siebeck, 2013. "The Temple Police: Double Agents." Character Studies in the Fourth Gospel: Narrative Approaches to Seventy Figures in John. Ed. Stephen Hunt, Francois Tolmie, Ruben Zimmermann. Tubingen: Mohr Siebeck, 2013. “Use of the Old Testament in the New Testament,” in J. Scott Duvall and J. Daniel Hays (eds. ), Baker Illustrated Bible Handbook. (Grand Rapids: Baker, 2011). “Vine, Shepherd and Bones: The Use of Ezekiel in the Gospel of John,” in P. Joyce and A. Mein (eds. ), After Ezekiel: Essays on the Reception of a Difficult Prophet(LHBOTS; London: T&T Clark, 2010). “The Logos and the Testimony: Large-Scale Narrative Features in the Gospel of John and Revelation.” Paper presented at the Evangelical Theological Society, November 2016. “Gog and Magog: a New Look at John’s Appropriation of Ezekiel.” Paper presented at the Evangelical Theological Society, November 2014. “All the Things Written About Him: A Narrative Analysis of the Use of Scripture in the Four Gospels.” Paper presented at the Evangelical Theological Society, November 2013. “The “Character” of the Scriptures in the Fourth Gospel: a Literary Analysis.” Paper presented at the Evangelical Theological Society, November 2012.